Naomi Masina Photography..Omi Photographer blog UTAH PHOTOGRAPHER: 10,000TH....GIVE AWAY!! Here's what you gotta do! Leave a comment. I will randomly draw a winner out of those who comment on this post....EASY ENOUGH? This will be open till Monday Morning (AUG18th,2008) @ 10am, and I will announce the LUCKY DUCK! In your comment let me know which MAJOR COOL, AWESOME giveaway you want!! If you are posting as "anonymous" just let me know your name and addy!! K guys! Here are some shots for Grandma! We tried a mohawk..we got Alfalfa. Ha...Look at little goldie, he will never know life without the camera. These turned out good. It is so funny because I see different members of your family in each picture depending on his expression. Oh Yea Congradulations on your 10000 visit. Soooo what do you want, if you win... Ruthie2?? I think you'd like Cafe Rio...Take Me! Take Me! You take such beautiful pictures! I got to your site from Chelsy's. Your family is so cute! Would love the photo book should I be drawn. 10,000?! That's awesome! I always love your blog! And your baby...he's growing up too fast! 1. super rad give away. that cd or the book...tough one...i'll have to say the book. 3. mind if I link you on my blog? That 1st photo is perfect in every way. Have you considered fashion/magazine photography? You'd do well. hmmm...and if I were picked I'd love food so, option #1. Erica...I'd love it if you linked my blog! Thank you for the comment. I can't help it, I love to capture the minutia of my every day with the kids! I love your profile picture! Good composition! Congrats on you gazillion visit... I've watched the ticker climb. HOORAY GIRL your photos are the awesomest!! Oh! and I LOVE giveaways!!!! Count us in! I'm with the book all the way although I gotta say it is a hard one with all your cool lil choices. I absolutely love your cute lil guy. Isn't bath time the best? He is soooooo cute with his alfalfa do. Love the blog and congrats on your 10,000th. THat is so amazing. Congrats!! I'm surprised it didn't go that high sooner :) And I think, if I win, I'll take the dinner.. I need a break. lol. Awww Golden is such a cutie! Congrats Om on reaching 10000 hits, I'm sure its going to double here in the next few weeks. If I'm a lucky draw, I think the cafe rio or CD would be great!! Much love. Ooooooo, the book, Da Book! and more pictures of your adorably Poly Alfalfa!! You are amazing Naomi!! and so is your Playlist, this is the first time I noticed you had music on here..I guess cause I never have my earphones on...bwahahahaha! I love this! That rocks that you have had so many visits. Everyone needs to see your talent. Hope I win the drawing! I have my fingers crossed for the book! 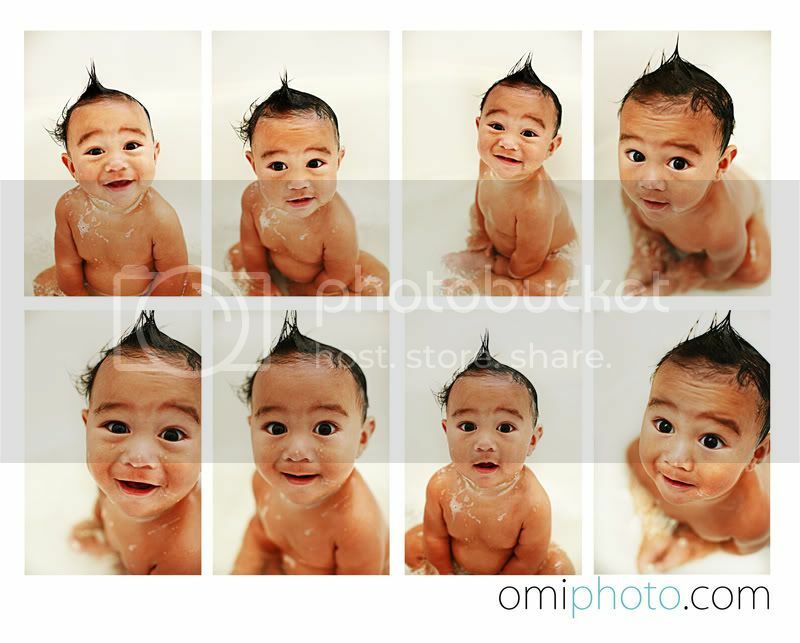 Cute mohawk pictures. My sons hair is to curly. I hope you don't mind that I liked your site off of mine. I just want people to see it. Hello! I'm an RSS subscriber and I am IN LOVE with your photos - you almost always capture a quality I very rarely see in this great wide web of photography. Keep up the good work! If fortune lands on my post, I'd love Scott Kelby's book - my meager photography library is having lots of trouble keeping up with the aforementioned great wide web. Your little guy is so precious! I love your photos and congrats on your 10,000th. Again, it doesn't suprise me what you are capable of doing! I'm still waitin to hear from you girl, but you could make it up to me by drawing my name from you giveaway and giving me the book! You have a beautiful baby. I just recently found your blog and I love your photography. It is so great of you to host a giveaway, I would love love love the Scott Kelby book. Om, I am so happy for your huge accomplishment, but no gift required. Just keep posting those fabulous pictures of my beautiful family so I can enjoy them here in Idaho. I LOVE these pics of the baby--he's such a happy little guy, and lights up all our lives. And if I do win...I want the CD. Omi,congrats on your 10,000 hits! I'm so happy for you. It'll only keep getting higher & higher! Thanks again for letting us come over last night. We love you guys! !